Habit: Perennial herb < 50 cm; caudex short, thick; taproot slender to thick. Stem: generally spreading to ascending, leafy to not. Leaf: basal 1.5--6 cm, rosette 1; cauline generally present, 0.8--3 cm. Inflorescence: axillary, umbel, +- open (dense in small plants), >= 2 per rosette, 1--10 cm diam; pedicel +- 0 to short. Flower: sepals 3--8 mm, +- round, scarious; petals 4, 3--7 mm, rose to white; stamens 3; style 2--4 mm, thread-like, exserted, falling with fruit cap. Fruit: 2--3.5 mm, widely ovate to +- round; deciduous or not. Seed: 1--4(8). Chromosomes: 2n=44. Ecology: Open areas, sandy or gravelly soils, conifer forest; Elevation: 300--3970 m. Bioregional Distribution: KR, NCoRH, CaR, SN, SnFrB, TR, SnJt, GB; Distribution Outside California: southern Oregon, Nevada, northern Baja California. Flowering Time: Apr--Sep Note: Hybridizes with Calyptridium umbellatum in SN. Synonyms: Cistanthe monosperma (Greene) Hershk. 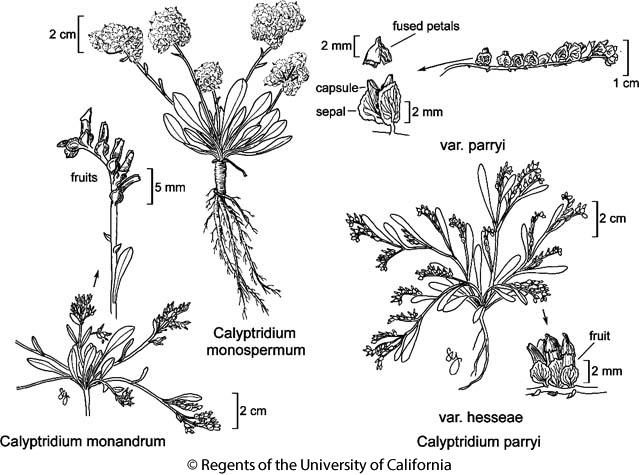 Citation for this treatment: C. Matt Guilliams & John M. Miller 2014, Calyptridium monospermum, in Jepson Flora Project (eds.) Jepson eFlora, Revision 2, http://ucjeps.berkeley.edu/eflora/eflora_display.php?tid=16846, accessed on April 19, 2019. KR, NCoRH, CaR, SN, SnFrB, TR, SnJt, GB; Markers link to CCH specimen records. Yellow markers indicate records that may provide evidence for eFlora range revision or may have georeferencing or identification issues. Purple markers indicate specimens collected from a garden, greenhouse, or other non-wild location.